Thanks to Rob Pincus, I have found a cleaner copy of Colonel John Boyd’s Aerial Attack Study (AAS). It was recreated by Mr. Mark Hart from the declassified 1964 version. The recreation is much easier on the eyes than the reproductions of the original mimeographed edition that are generally available. Prior to Colonel Boyd’s AAS, fighter combat was viewed by the majority of fighter pilots as an intuitive skill rather than one that could be codified. Some conceptual principles had been developed along with elementary tactics such as the Thach Weave, but Boyd was the one who wrote the definitive book. Only Major General Frederick “Boots” Blesse had preceded Colonel Boyd in writing a book, No Guts No Glory, about jet fighter combat. Major General Blesse’s book wasn’t the exhaustive treatise on the subject that the AAS was. A friend of mine shared a memory of this article on Facebook. I’m glad that he did. I’ve evolved my thinking about Orient to include more nuance but the article is still a good primer on the depth of Boyd’s concept and how we can and should apply it. And please keep in mind that it does a disservice to Colonel Boyd’s ideas when they are reduced to a simplistic four point circular diagram. Policies, SOPs, or whatever you wish to call them are simply committing to memory, or writing down, actions that you have thought about ahead of time. For some reason, the word ‘policy’ evokes a great deal of resistance on the part of people I talk to about it. Not thinking about things ahead of time is probably the most Serious Mistake Gunowners Make and I will have to add that to the next edition. In a crisis, the conscious mind has an extremely short life span, probably less than a second. Once the conscious mind expires, either training/practice or the amygdala will take over. Trying to make up a plan on the spot is an extraordinarily difficult task. Perhaps the inability or lack of desire to think ahead is the reason for the popularity of the OODA Loop. Relying on the OODA Loop implies that you can out-think the situation in the moment. This is just being lazy and an excuse for not thinking ahead. No plan survives the test of combat, as the saying goes, but it is ALWAYS easier to modify a pre-existing plan than to make one up on the spot. Fighter pilots have been at the forefront of developing policy and procedure for ‘in the moment’ encounters. Their creations over the past century have shown increasing sophistication as they have evolved. Dicta Boelcke, a list of principles, was formulated during WWI by Hauptmann Oswald Boelcke, a German fighter pilot and squadron commander. It is interesting to note that he was killed when he violated one of his own dicta, never close in on a single combatant when others are also pursuing it. Lieutenant Commander Jimmy Thach recognized the superiority of Japanese fighter aircraft in the early days of WWII. To counter them, he developed, using matchsticks on a tabletop, the Thach Weave as a defensive maneuver. Then he tested the maneuver under conditions simulating the disadvantages US Navy fighters would face. No Guts, No Glory, a USAF training document, was written by Major General (then Major) Frederick C. Blesse shortly after the Korea Conflict. It was an explanation of his experiences flying F-86 Sabres against MIG fighters and how to defeat them. Colonel John Boyd wrote the Aerial Attack Study, which is the most comprehensive manual on fighter combat ever written, in 1959. In it, he methodically worked out all the possible attacks and counters a fighter could make in relation to both bombers and other fighters. His study was heavily based on a thorough understanding of the flying and weapons capabilities of both US and Soviet aircraft. In every one of these documents, specific principles, procedures, and pitfalls are worked out in advance. Speed of decision in tactical situations is achieved by picking from a list of possible options to best solve an unfolding incident rather than trying to ‘think faster,’ which is physiologically impossible. The distinction between ‘thinking faster’ and picking from a menu of possible decisions escapes many common taters about the OODA process. Boyd’s description of the process is much more involved than generally assumed and explained using a simplistic circular diagram. That circular graphic does no justice to the concepts that Colonel Boyd developed. In order to make decisions in advance, it’s necessary to think about likely scenarios, at least, ahead of time and decide how to solve them. This includes the legal ramifications of your possible actions. Thinking ahead is a key component of avoiding becoming a victim or incurring a Negative Outcome in the criminal justice system. John Johnston and I will be discussing this timely topic in more depth on Ballistic Radio tonight. Ballistic Radio is available over the Internet. The latest edition of The Tactical Wire is the Concealed Carry Special Edition. It includes an article about the OODA Cycle that I authored. The OODA cycle, frequently referred to as the OODA Loop, was developed by the late Colonel John R. Boyd, USAF. The OODA cycle has subsequently become highly influential in thinking about how to conduct combat operations at all levels from the tactical to the grand strategic. It is often simplistically depicted with only four components in a circle, although that hardly does justice to the depth of Boyd’s thought. What it’s not is what is so often pictured. The article is my explanation of why. There are several other good articles also. Planning for the worst case? Living in California, I think it may be in my best interest to consider the worst-case scenario. I’ve previously mentioned my issue with planning for the worst case, but since ‘worst case planning’ comes up so often, the topic bears some further discussion. The essential problem is assuming that planning for the worst case is merely planning for the most likely case taken to a greater extent. Unfortunately, that’s not necessarily true. The optimum solution in worst case planning may actually be a less, or even least, optimal solution for the most likely case. The questions of competing probabilities and definitional issues rear their ugly heads again in this decision process. As an example, the worst case scenario that people imagine in a home defense scenario consists of multiple intruders, armed with projectile weapons, with their weapons in hand, ready to shoot the defender in reaction time. While that’s certainly possible, it’s definitely not the most likely case, if the bump in the night is really a burglar. And even the definition of ‘worst possible case’ is open to question in the context of home defense, as is the definition in many contexts. The question I posed previously was “Is ‘the worst possible case’ having a dangerous armed intruder in your house or shooting and killing a family member by mistake?” Therein lays the definitional issue. The statistical/tactical issue is that the most likely case is probably a lone intruder, not armed with a projectile weapon, who is preoccupied with stealing your stuff and not waiting in ambush for you. I’ve been in a confined cloud of CS from a grenade; it’s incredibly incapacitating. That’s where I got the idea. It’s not like the CS chamber most veterans have been exposed to. I was certain of the efficacy of this plan, since even a hardened group of assassins would be unlikely to expect a counterattack that would have made John Wick look like an Eagle Scout. However, I did consider that there were several downsides to the plan. 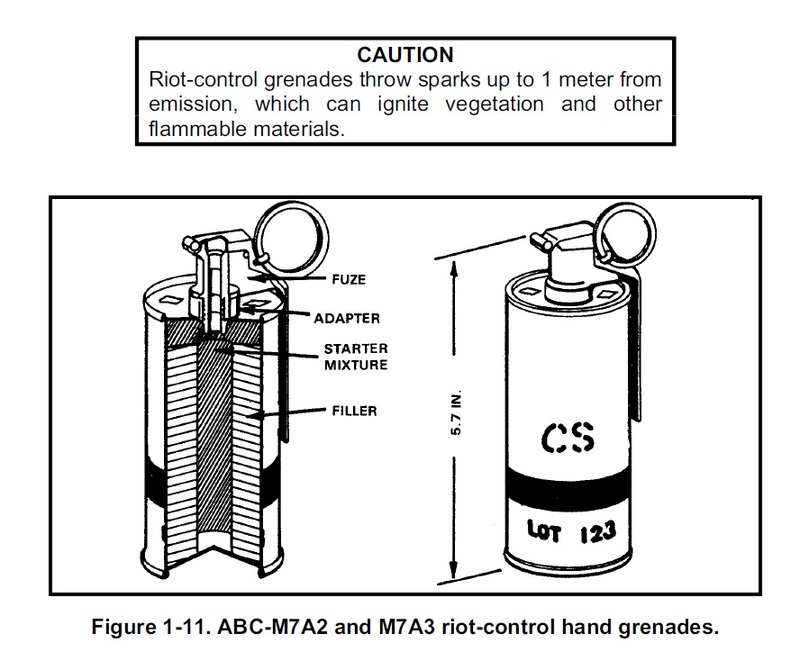 Most likely, the grenade would have set the house on fire and burned it down. My landlord would have been unhappy and the couple who lived upstairs might have burned to death. The authorities probably would probably take a dim view of my executing a bunch of people, even if they did have nefarious intent. I had also planned a lower intensity response for the more likely scenario of one guy with a screwdriver stealing my stuff. That plan was to challenge him from whatever concealment was available and tell him to get out. If he took one step toward me, I would have shot him. If I could see he had a projectile weapon, in hand or not, I would have shot him immediately. Note that even in a simple scenario, there’s a decision tree (if, then, else). Those kinds of decisions are best made ahead of time. 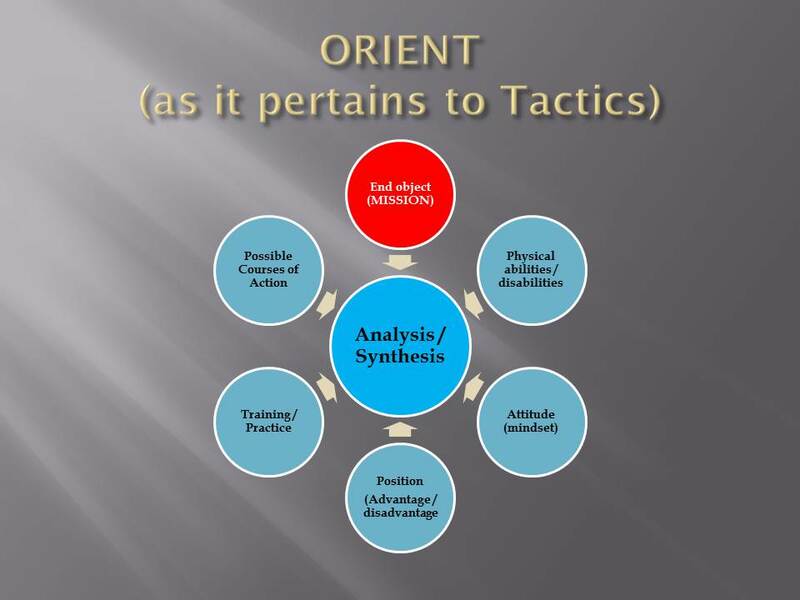 Making decisions before the situation arises is part of the Orient phase of the OODA process. Forward looking decisions are what allow you to speed up decision-making in the moment, not trying to think faster on the spot. 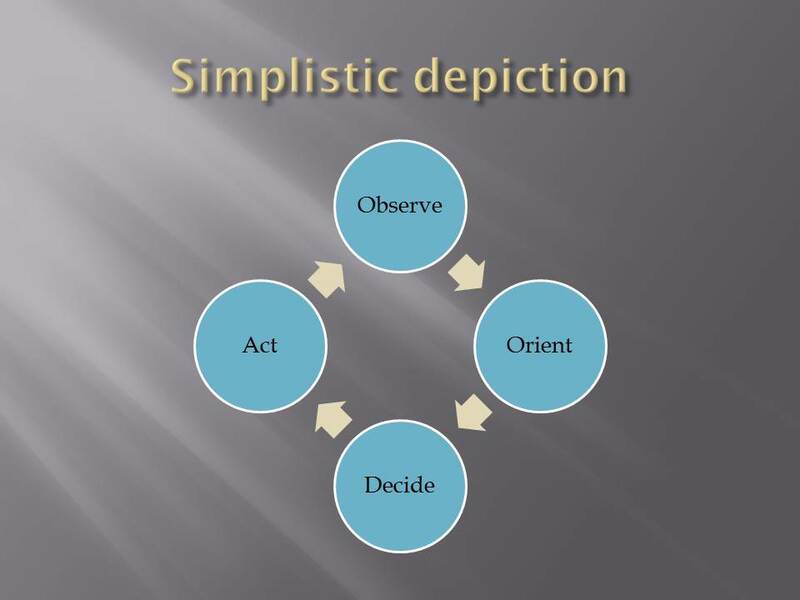 Trying to construct a decision process in the midst of an incident will force you back into the Orient phase and actually slow down your decision-making. The issue with worst case planning is that it usually ignores both the direct and opportunity costs implicit in the plan. Worst case planning also frequently lacks any branching or contingency aspects, which is not the way life works. Consider carefully ALL the ramifications of worst case planning in light of most likely case possibilities. What you may find is that it’s best to plan and prepare for the most likely case. Then, think of how that plan can be adapted to a much smaller probability of the worst case scenario.